The Primitive Black End Table will bring a rustic touch to any living room. 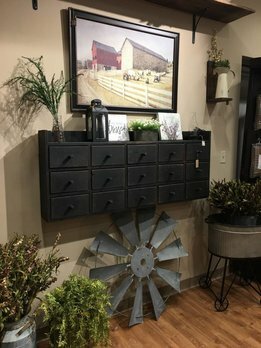 This distressed black cabinet would also look great in an entry or bedroom where you need extra storage. Made of solid wood in the USA. This traditional Apothecary Cabinet is a beautiful piece of Period Reproduction Furniture. 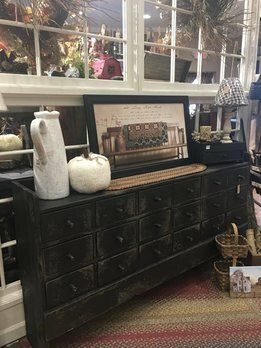 Made of solid wood in the USA this 16 drawer cabinet will go well in an entry or bedroom and would also look terrific in the hallway of your country home. This large Apothecary Cabinet is a statement piece in any country home! Distressed and made of solid wood in the USA. You'll love the 18 drawers for storage! Perfect as a sofa table, in an entry, bedroom and or in the hallway of your cozy home. 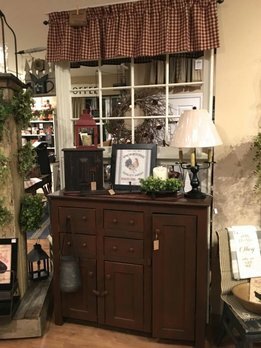 The Primitive Apothecary Wall Cabinet creates a focal point for your cozy space! Made of solid wood with 12 drawers for storage this beautiful piece is also a shelf for to display your favorite treasures. A really special design made in the USA. 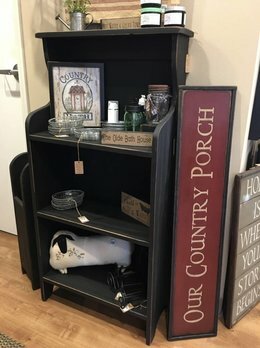 This Black Book Shelf is a great storage option. Made of solid wood in the USA you'll love the quality of this piece. Available for local pick-up only. 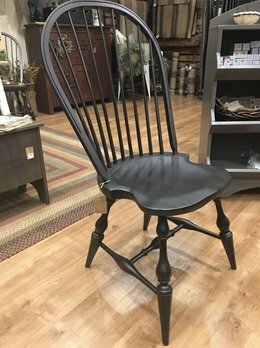 The beautiful Bow Back Side Chair is made using the techniques from Early America. This chair is perfect to go with a table you have or at a writing desk. 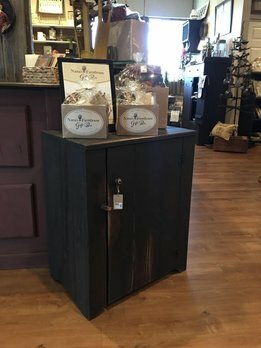 Add this unique piece, Coffee Bar Cabinet, to your home. Made of solid wood this cabinet combines a place for your coffee maker, storage and a place to hide your trash can (see both photos). Perfect for any home or cabin where storage is at a premium. 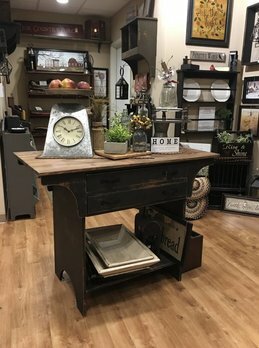 This Country Primitive Kitchen Island is a perfect addition to your kitchen. Extra counter space and lots of great storage! A great feature is the two drawers that pull thru from either side. Available for local pick-up. 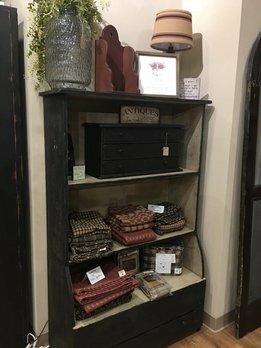 This Primitive Cabinet Barn Red will be a beautiful addition to any cozy farmhouse. This solid wood classic will be a terrific addition in a entry way or bedroom. Made with 4 drawers & 3 doors this piece is flexible with great storage. Top off your farmhouse style with this Queen Farmhouse Antique White Bed! Made of solid wood this bed is sure to bring the added touch to any bedroom in your home. Available for order in this color and others. Call us for details. Bring a touch of yesterday to any room with this timeless Country Vanity. Distressed with a 3 coat finish this is a beautiful piece made of solid wood. Perfect in any room but especially a cozy bedroom. Made in the USA!